This NOTD didn't turn out like I had wanted it to. I intended on using striping tape but when I sat down to do my nails I realized I had left the striping tape in my room which is also the room the (teething) baby was napping in at the moment, so I free-handed it. 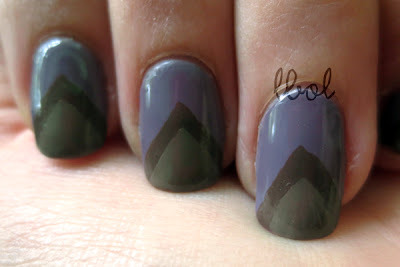 Also, It wasn't just s'posed to be a standard triangle-tip manicure but that's what it looks like. I needed to make the second stripe further down on the nail, etc etc blah blah etc. I like the subtle orange sparkle/shimmer in Wooden Shoe. Layla dries to a semi-matte finish (hence Softouch!). Parlez-vous is kind of runny, IMO. Ee-moe. Aaand that's what I have for you. PS The last 4 blog posts I, you know, post... they show up +1'd. Like, immediately. And I'm certain that someone isn't just refreshing their browser waiting for my next post to +1 it. And I'm not trying to actively advertise every single post I make. I guess I'm just this about it: ? I love this! 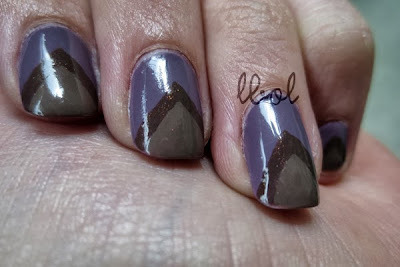 Great color choices and it looks fine freehanded! I'mma redo that shiz one of these days, and switch the color order around probs. But thanks doe.